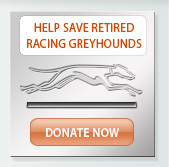 Sending the adoption fee along with your application is an indication to us of your commitment to adopt a greyhound. The adoption fee can be paid one of two ways: you may send a check or credit card information for the full amount of $280.00, or you may send a check or credit card deposit for $180.00, with the remaining $100.00 balance to be paid at the time you pick-up your new pet. Tax for the full adoption amount of $280.00 will also be applied at that time as will the fee to register your new pet's microchip. Adopters using Visa and MasterCard will be charged an extra 2% processing fee and adopters using Discover and American Express will be charged an additional 5%. 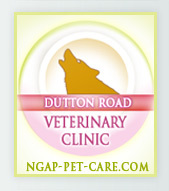 *You will also be charged an additional fee at pick-up to register your microchip with HomeAgain. NGAP will register your greyhound for you! We cannot start the adoption process until our adoption fee is received. Any application received without the fee will be placed on hold until the adoption fee is paid. If for any reason your application is rejected, or we cannot supply you with a greyhound, your monies will be returned. Once we receive your adoption application, reference form and adoption fee, we will call you to confirm receipt and will then begin the process of checking your references. Once your references are returned, your information is sent to our Adoption Coordinator. Our Adoption Coordinator will carefully review your application and select the best dog for you based on your family and lifestyle. We generally house 50-80 adoptable greyhounds at any given time. If you would like to come look at our greyhounds before you submit your application or at anytime during the application process, you may do so seven days a week including holidays from 9-11am and 2-4pm. If you would like to make a short list on your application of 3-5 dogs that appeal to you, you may do so with the understanding that there is no guarantee that you will get any of the dogs on your list. Our Adoption Coordinator works very hard to make sure she finds the dog that is the right match for each adopter's situation. Although we will try to take your requests into consideration, our utmost priority is the happiness, safety and well-being of you, your family, your other pets and of course, the greyhounds we adopt out. Please note: Because many of our adopters have cats and a percentage of our dogs are not cat safe, cat-friendly dogs will never be allocated to families with no cats. 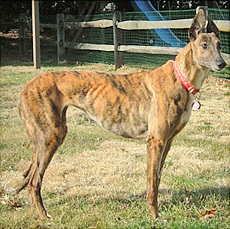 Each of our greyhounds goes through an extensive shake-down process which includes a complete medical check-up, a bath - to rid them of external parasites, worming - to rid them of internal parasites, neuter/spay and then a period of time to settle in so that we can properly evaluate and profile them. At NGAP, we take the selection of your greyhound very seriously. Because we run such a large kennel, we have a vast selection of greyhounds to choose from when matching them with their new potential owner. Each greyhound is carefully observed and evaluated, cat-tested (generally speaking, dogs that have tested as cat friendly will be reserved for homes with cats), and isn't being pushed out the door. This, we feel, is the best way to receive a greyhound into your home. 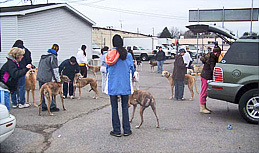 Our staff has successfully re-homed more greyhounds than any other single facility in the United States. Many people feel that someone else cannot pick a greyhound for them. Our process has proven them wrong! This does not mean that you cannot look at all of the greyhounds that are available for adoption or that you can't give us preferences - you surely can! Our statistics show that by using our evaluation process, we have a much lower rate of return of greyhounds than that of programs that allow adopters to make their own selections. 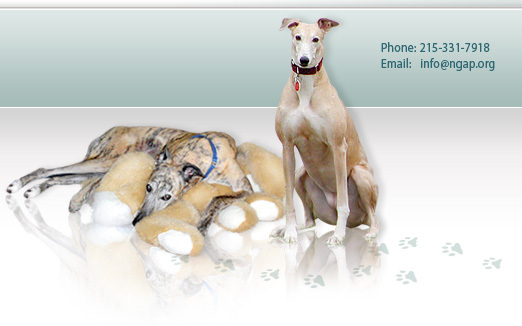 Once your greyhound is in your home, you can rely on support forever if you need it. We are available to respond to adopter's needs almost 24hours a day everyday. If you cannot keep your greyhound, you must return it to us and we will find it a new home. 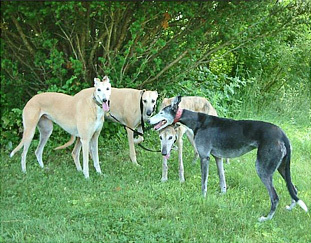 We find homes for many older greyhounds. NGAP will continue to provide any support you may need from the time you take your greyhound into your new home until the end of its life. If you ever have any questions, please do not hesitate to call our office at 215.331.7918.